Real Riders: KTM 1290 Super Duke GT Review, A Turning Point ! KTM 1290 Super Duke GT Review, A Turning Point ! There was a time when sports-tourer meant fast but heavy, straight-line speed but hampered nimbleness. The new KTM 1290 Super Duke GT combines the engine and frame of the high-performance 1290 Super Duke R with the second generation of semi active suspension seen on the Austrian company’s 1290 Super Adventure. It’s got cornering LED lights, it’s got integrated luggage capability, it’s got a 23 litre tank and it’s got a screen. 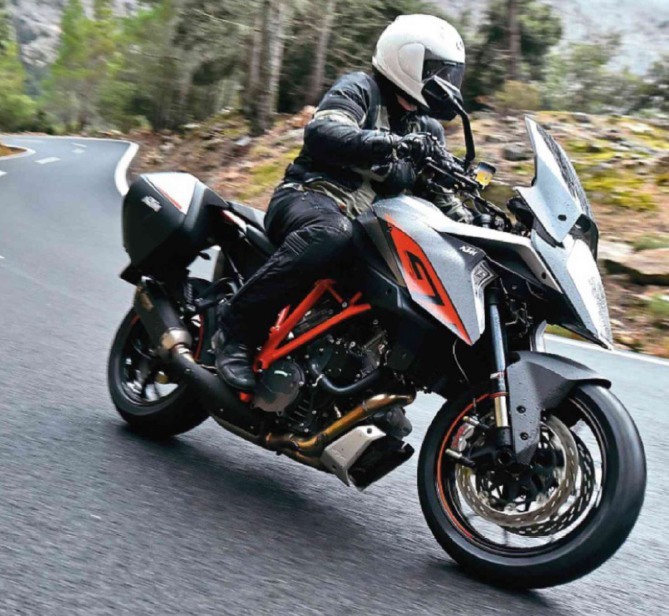 The project is said to have started during the original Super Duke testing, when development riders realised that a screen and panniers, the bike could be ridden all day long over great distances. 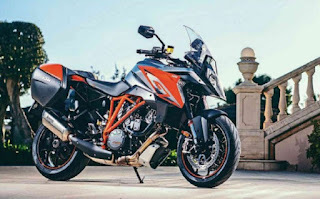 A prototype was built, and from that came the new KTM 1290 Super Duke GT. While the main frame is exactly the same as that fitted to the Super Duke R, the rear subframe is 10cm longer, as well as stronger, to accommodate luggage. The pillion pegs have also been lowered, but the best way to know how long your passenger will want to spend on the wide, well padded (and optionally heated for £161.52) seat is to let them have a sit on one at the dealer. This twin-spark LC8 engine is basically the same as that in the £14,149 Super Duke R. Changes to meet Euro 4 legislation were inevitable, but a redesigned, valve equipped exhaust and a new cylinder head combine to offer the same claimed peak power of 170bhp, but 635rpm later in the revs. More importantly, peak torque is again the same as before, but the 106lb-ft comes in 1000rpm earlier than it did on the R.
Moving the torque curve forward is a good move for a machine like this, though it was never lacking on the more street/track focused model. It means that peak torque is now reached at the same point as the 1301cc motor fitted to the Super Adventure, but with a 3lb-ft gain. Impressive. 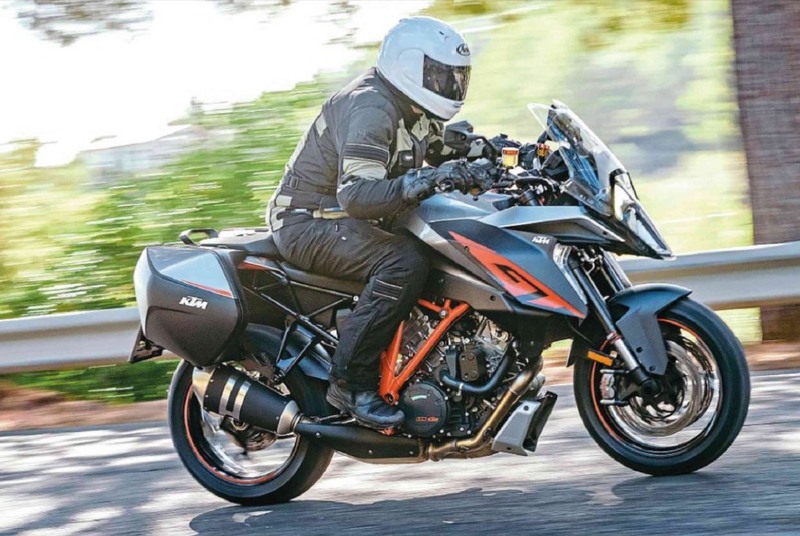 The gearbox and final drive ratios of the new bike match those of the SuperDuke R, as does the 13.2:1 compression ratio and hydraulic slipper clutch, operated by a radial master cylinder. The fuelling is mapped to be slightly smoother than the R, tied to three riding modes, which also influence the cornering ABS and traction control: Sport offers full power and torque with the most limited interaction from the electronics, Street maintains all the peaks, but everything is toned down just a touch for more real-world riding (my favourite setting), and Rain reduces peak power to 99bhp (100hp or 74kW) and 74lb-ft (100Nm). It still feels natural, but you are aware of the restraint the bike is using. The electronic safety aids are at their most prominent here, but they’re still far from intrusive. 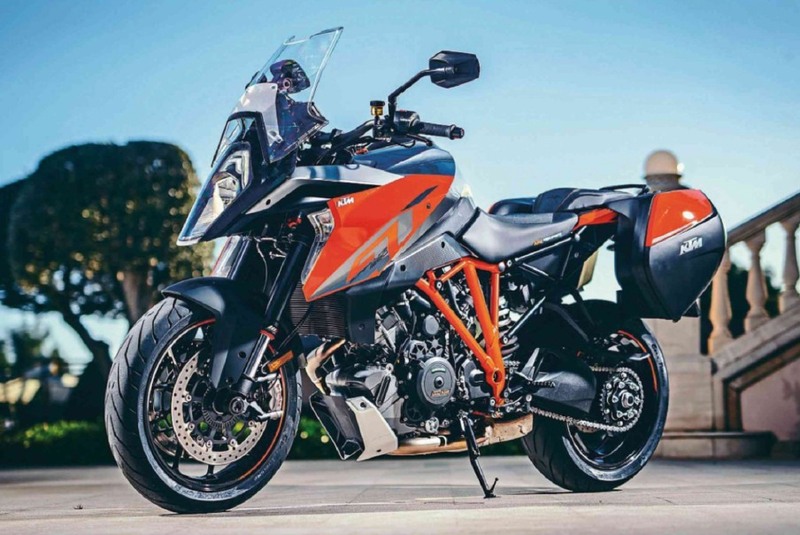 This new KTM 1290 Super Duke GT comes with the next generation of semi-active ‘skyhook’ suspension, as fitted to the 1290 Super Adventure (the 1190 Adventure’s electronic suspension just allows you to select different modes). 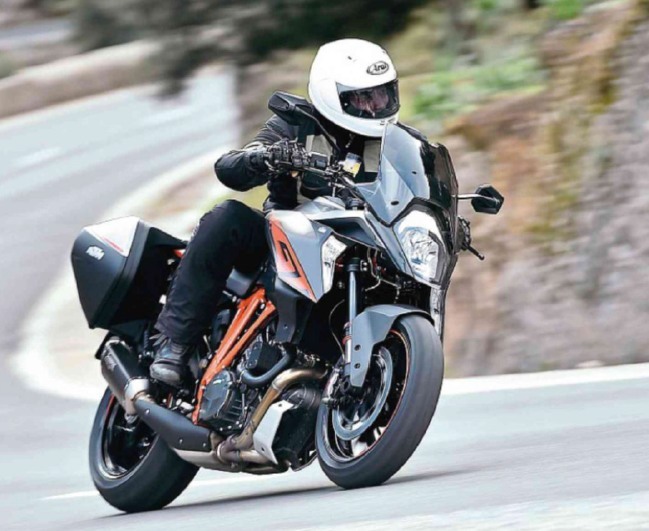 As the travel is shorter on the KTM 1290 Super Duke GT’s suspension, the calculations need to be made that much quicker; it’s claimed that the damping characteristics are switched within 10 milli-seconds on the new bike. The non-lean-angle dependent system works by measuring acceleration forces at the front and rear of the frame, combining it with data from a travel sensor in the fork, and a rotation sensor in the swingarm pivot. Up front, the left stanchion has the stroke sensor and spring, while the right has the valve and damping rods. The fork and rear shock spring can be changed if necessary, and this won’t affect the performance of the semi-active damping. The system also recognises if there’s a pillion on the bike, and modifies the damping to suit. Front preload is fixed, but the rear preload is adjusted via the dash to suit rider only, rider and luggage, rider and pillion, or rider with pillion and luggage. There are three damping modes – Sport, Street and Comfort. I found Street ideal across all the roads we took. Comfort has much softer damping and is ideal for slower rides over poor surfaces, while Sport firms the front and rear, and removes anti-dive – something the fastest riders will prefer as it allows the geometry to change more under braking, making the bike faster to turn in. And it can be very crazy, the 1301cc 75° V-twin being gloriously smooth and powerful from around 4500rpm, the chassis light and very nimble. Yet it is comfortable – we rode over 160 miles in everything from warm sun to hail. 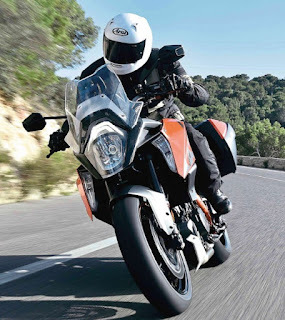 The weather protection isn’t up to that offered by a BMW tourer, particularly around the hands, which I would really want protected by some after-market guards during winter, but it’s very different to a naked Super Duke. The KTM 1290 Super Duke GT is reasonably light at 228kg ready to ride (a BMW R1200RT is 274kg), but it never feels loose or flighty. Nudging the bars at speed hints at the fast turning ability, but I found it unflappable on the tightest, bumpiest routes, no doubt helped by the unobtrusive standard WP hydraulic steering damper. Equally, a section of fast, rolling, straight road was utterly comfortable, interrupted only by the bike once lifting the front wheel about a foot off the ground thanks to a surprisingly sharp crest. The traction control took care of it, if rather abruptly. The semi-active suspension can react within 10 milliseconds, but of course, it cannot ‘see’ the bumps coming, so will be reacting after the initial impact. One fast right-hander was followed by a sudden dip in the road, then another fast left – the bike dropped away from me between bends but immediately settled itself. I’ve ridden new bikes in the last year that would have made that second turn much more frightening as the rear bounced itself into submission. It’s hard to assess the success of the system without comparing it back-to-back with a standard setup on a variety of surfaces. I can only say that my experience was of a front and rear that never made itself known. On a machine with this level of performance, I think this should be taken as a big compliment – I never felt the bike wallow, yet it also failed to be harsh or crashy. The last thing I want these days is a motorcycle that jars me as I ride, and for such a nimble bike, I think it’s all credit to WP that the level of comfort is so high. Could a well-tuned single-profile standard fork and shock perform as well? Maybe, to a point, but to have that work out of the crate for a wide range of riders, with and without a pillion and luggage, on roads throughout the world and even on track seems implausible. Some riders might be confident that they could set up their suspension to suit the road they’re riding, but I can only say that on the fast, dry sections of tight, twisty mountain I felt completely confident on the GT, and able to enjoy flicking it between corners. When the surface got wet and slippery, I had every faith in the machine, while on long, rolling high-speed straights and motorways it was as comfortable as almost anything else I’ve ridden. I no longer believe suspension that ‘thinks’ could prevent me from knowing what the bike is doing; more that it’s a clever way of giving a very good set-up to riders like you and I who don’t want to spend our time worrying about, or manually adjusting, rebound and compression settings. The standard Pirelli Angel GT tyres offered superb grip on the Mallorcan roads. As the going got wetter, they continued to perform, even on some of the frighteningly slippery surfaces that were difficult even to walk on – I was shocked at how much grip could be maintained on something that felt like Teflon-coated glass. But that grip did run out – first when I deliberately snatched at the throttle on a straight, then later as I entered a tunnel on a bend, the rear kicking out a few inches before gracefully maintaining drive. Manufacturers always aim to launch their bikes in dry, sunny conditions, but this was the first time I’ve been pleased to have the chance to really experience the levels of safety offered by traction control. On some other recent machines, it felt more like a plug being pulled than this, which gave me the confidence to ride in conditions that would usually see me backing way off the pace we achieved. The KTM 1290 Super Duke GT's screen has seven positions, but I found it tricky to locate when riding, needing more force than I’d like to lock in place. Having said that, in day-to-day use you’re more likely to set it once or twice at most during a ride. Or even just leave it at the top position – at 5ft 11in I found that in this setting it was effective up to 80-90mph. By the time you reach 100mph though, windblast is quite strong; if you’re expecting to be riding the autobahns a lot, a taller screen would be preferable. The panniers are a £648.35 option, very easy to use, and take a full-face lid each. Operated by the ignition key, the lock has three positions: the first has the panniers locked to the bike and locked closed, the second lets you remove the key, but leaves the panniers able to open quickly via the large button. Position three releases the boxes, and allows them to be lifted straight off the bike. This is by far the simplest system I’ve used, being incredibly quick to remove and replace the panniers without any hassle trying to locate the fitting points. Tyre pressure monitoring is standard on the KTM 1290 Super Duke GT, with the current PSI or bar displayed on one of the pages of the dash’s display. If pressure is lost, a warning will be given. Cruise control is another touring luxury fitted to the bike – three simple buttons on the right-hand switchgear allow any speed between 25mph and 124mph to be set in any gear from third and up. It’s turned on with a small switch, then set, adjusted or resumed with the two-position rocker button below. The indicators are also automatically reset after 10 seconds or a distance of 150m – it’s a great idea, but I’d prefer to see it implemented with more of a leaning towards distance travelled. Having used it for a while on other KTMs, I’ve found it can occasionally disable the indicator when you don’t want it to, for instance when turning right on a large roundabout that you’ve been waiting to join. Thumbing the button to check it’s still on needs to become the habit for many of us who currently thumb it to check it’s off. Our test route saw us moving around a lot as we tackled the often fast or twisty roads, but I did find the standard seat very comfortable (and I seem to have extremely sensitive cheeks). Halfway through the trip I swapped to a machine with the optional (£202.06) Ergo heated seat and at first I was very aware of the 13mm higher profile, which made me feel slightly perched on the bike compared to the standard setup. But within a few dozen miles I was at ease again, and as the weather turned nasty I was pleased to have the warmth complementing the standard heated grips. Both give a good amount of heat, though without guards the grips soon chill off as you move your hands. When the ride briefly dried out, I had a moment of panic as I tried to remember where the settings were for the heating elements (they’re easily accessed through the left switchgear, and displayed on the dash). In warm weather, at maximum settings, I was getting cooked; I’d say they’re powerful enough. The new bike gains five litres over the original Super Duke R, with a capacity of 23 litres. During a very fast motorway and A-road section of the ride, I achieved 40.4mpg over almost 40 miles. That would indicate a range of 205 miles. Over the twisty mountain roads, and at relatively high speed, I saw 33.5mpg, with another rider recording 36.6mpg. As I’m a little heavy-handed on the throttle, using his figures would indicate a range of 185 miles. It’s not a patch on the potential offered by the 1290 Super Adventure and its 30 litre tank, but a balance had to be struck between weight and range. I’d say KTM have got it just about right, and with more sedate riding, I wouldn’t be too surprised to see 230 miles from a tank. The KTM’s components are of a very high standard, right down to the fairing fasteners, but if you want a stunning engine, in a uniquely high-performance touring package, you’re going to have to pay for it. At £15,999 the KTM 1290 Super Duke GT is an expensive proposition – a similarly specified BMW S1000XR costs £13,695, or a Honda VFR1200F is £12,999. But neither has quite the same sport/touring mix. I found myself going faster than I realised at times, over-shooting one corner early in the test that took me by surprise. Of course, the bike would easily have dropped into the turn, but there’s no mistaking that this is an incredibly rapid machine. As the pace quickened, I had to grip the tank more with my knees and take the impressive braking performance through my core, not my wrists and forearms, if I wanted to maintain this speed throughout the day. 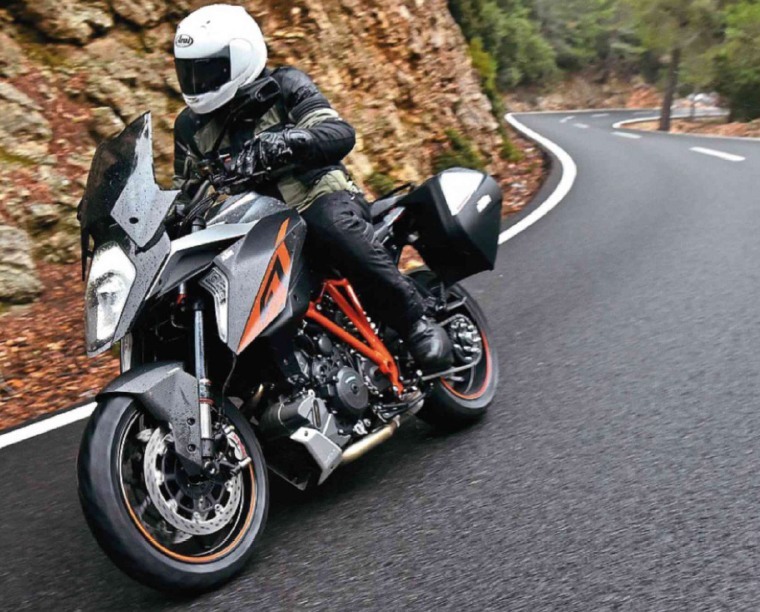 Realistically, most owners won’t be going hell for leather all day, on tight, twisty mountain roads, but however you ride, the new KTM 1290 Super Duke GT shines. It truly is a multi-purpose road bike. There’s no denying that the comfort offered by the adventure machines still exceeds this, the most sporty of sports-tourers. But if you thought your body had closed the door on sportsbikes, or that your luggage requirements would forever limit your choice when buying a bike, then the KTM 1290 Super Duke GT has the potential to transform biking as we know it. Speed, comfort, practicality and safety – four words that have never before sat so comfortably together.